On Solange's new album A Seat at the Table, the singer beautifully pares the layers of black identity while giving respect to legendary black musicians. The day before the album was released, Solange revealed via Twitter that the "great" funk musician Junie Morrison was the inspiration for the song "Junie." Morrison's own impact on the world of funk starts with his role in the 1970's as a writer, arranger, and producer for the soul-funk band Ohio Players. Later in the decade, Morrison wrote and produced music for the pioneering cosmic collective Parliament Funkadelic. Solange channels some of Morrison's musical liberation in the song "Junie," an ultra-groovy jam that confronts the appropriation of black culture. She sings: You want to be the teacher/ Don't want to go to school/ Don't want to do the dishes/ Just want to eat the food. In a recent conversation, Morrison shared his reaction when he learned that Solange named the song after him. 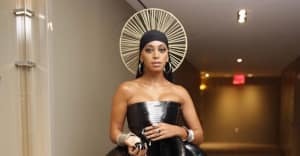 "I believe that Solange has a great talent for representing and promoting freedom,"Morrison told The FADER over email. "Freedom to be outwardly and inwardly creative." When did you find out that Solange was going to name the song "Junie" after you? To be honest with you, I found out about that particular song just a few days before it was released. She kept it very close and wanted to surprise me with the news. When she informed me about her song, I was a bit taken aback by the surprise but very appreciative that she wanted to put time and energy into creating it. She indicated that she had written a song around my vibe and inspiration, and also indicated that it was very long and called, “Junie." Suffice it to say, I was like, WHAAAT???!!! She communicated to me that she wanted to tell me the story of how much my track “Super Spirit” made an impression on her and inspired her to name her creation, “Junie." She wanted me to hear her creation and speak to me about it. My initial reaction to hearing the song itself was the same as I had while listening to the rest of A Seat At The Table—Wow! This young person has a whole funk load of talent. It’s all good. I instinctively knew Solange, only through the connection we all have as beings on this planet. Strangely enough, it was almost akin to what one would call fate, especially since her brother-in-law started his career by sampling one of my early creations called, “Ecstasy.” Fate is funny that way because I have also been a fan of Solange’s music for years. I liked, among others, “T.O.N.Y.” and “I Decided” quite a lot. In fact, my good friend and great music aficionado, Melissa Weber a.k.a. DJ Soul Sister, formally brought us together, earlier this year. In your solo projects, you've addressed some controversial topics. A Seat at the Table is deeply aware of our current moment and directly confronts feelings surrounding black identity. How does that speak to your legacy and music career? By cultural appropriation, I believe you mean "What happens when stuff gits stole." If so, I would consider it a perfect way to illustrate the point. One should only remember, however, that to sample a piece of fruit pie need not be the only experience. There will always be more pie to fruit.